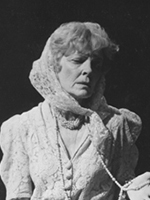 Miss Barker first appeared in student productions at Bryn Mawr with her classmate, Katherine Hepburn. Margaret Barker was born on October 10, 1908 in Baltimore, Maryland, USA. She began her career in 1928 as the flirtatious Alice Fordyce in the Broadway production of "The Age of Innocence," which starred Katharine Cornell. Three years later, she appeared as Henrietta in "The Barretts of Wimpole Street" with Miss Cornell. She left that production to join the Group Theater, taking major roles in "The House of Connelly," "Men in White" and Clifford Odets's "Till the Day I Die. She was also known for Another World (1964), The Doctors (1963) and The Edge of Night (1956). She died on April 3, 1992 in New York, USA.